View a history of posts Edgar has published for you on the History Page. Or view the individual content performance for each post, which also includes click information if you use ed.gr or Rebrandly for your URL shortener. Why don't my Instagram posts have a link to them? The History page displays a list of posts Edgar has published that you can filter with the drop down menus at the left or sort with the column headers at the top. Want to see which post in your My Blog Posts category gets the most clicks? Choose My Blog Posts from the category drop down menu and then click on All Time Clicks at the top of the clicks column. Click on the link under the timestamp of a post to see the post on the social network. Or click on the "View performance history" link next to the text of a post to be taken to that post's individual content performance page in Edgar. 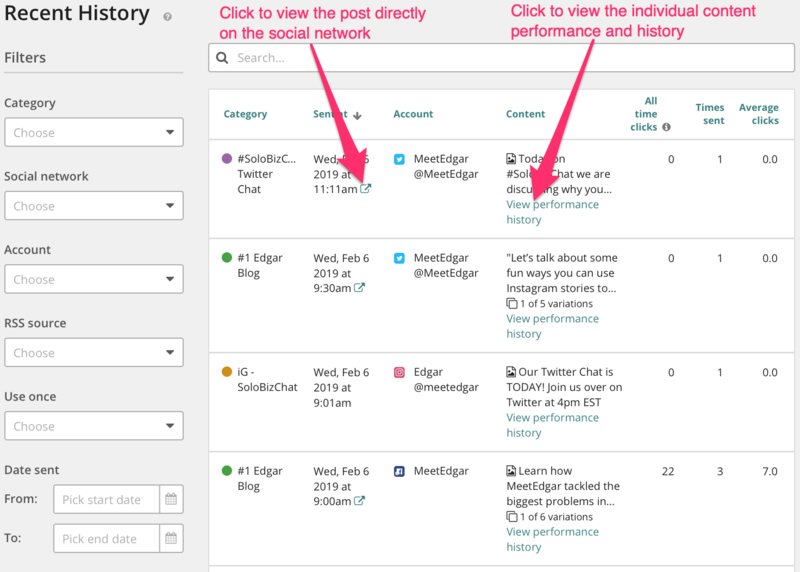 Click the "View performance history" link on the post in the History page, as shown above. Or, locate the post in your Library and click the History button. The Content Performance page lists the times each variation of the post was published. And if you use ed.gr or Rebrandly for your URL shortener, click data will also be displayed along with which of your variations has performed best. 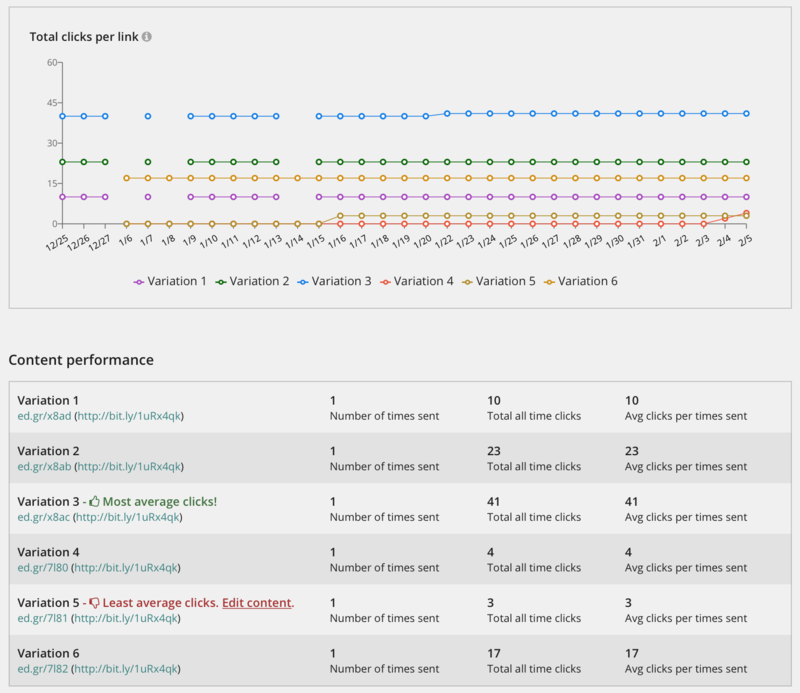 Under the filters on the left side of the History page is an archive of your past weekly performance reports. These reports are sent to you via email each week. To view a past report, locate the date of the report and click on it. That's because you publish your Instagram posts live when Edgar sends the push notification to your iOS device. No permalink is created at that time and Edgar is not able to grab one from Instagram. To view your Instagram posts, please visit your Instagram profile on Instagram. *Edgar supports Instagram posting via reminder notifications. Direct posting to Instagram is only available for select Instagram partners at this time. Edgar is not one of these partners just yet, but we have applied and hope to be approved soon!